During the period of 21-25 Nov. 2010, the UOB underwent an Institutional Review by a panel of experts selected by the National Authority for Qualifications & Quality Assurance of Education& Training QQA. The process of institutional review requires the development of an Improvement Plan based on the Commendations, Affirmations and Recommendations included in the IR Report. After submission of the IR Improvement Plan to the QQA, a follow-up report is produced that reviews the progress made toward these improvements. Based on a visit by QQA to the administration at UOB, a revised progress report is produced. This document is produced by the University of Bahrain to outline the improvements and actions taken to fill the gaps identified in the IR report and enhance or build upon the good practices. The committee assigned for the development of the Improvement Plan used the following process for developing it. Review the requirements for the Improvement Plan from the HERU Institutional Review Handbook. Produce a table summarizing the UOB IR Report points including a summary of the comments of the panel. Align any recommendations or points with any existing committees, initiatives or work-streams within the University’s Strategic Plan 2009-2014. This was mainly done to eliminate duplication of efforts and to consolidate the strategy. Assign “ownership” of each IR point to a designated person, either from the strategic plan committees or the responsibilities of the senior University management. Assign “follow-up” responsibility to senior management for each point. Identify key tasks in each point. Prepare a template with the following fields for each “owner” to complete. Action Plan with schedules and status indicators. Performance Indicators for the tasks (indicating current and targeted levels). Resources needed for the task. Prepare a workshop for all of the persons involved in the planning process including owners of points and follow-up staff. The workshop explained the terminology of the IR report and the process of review, improvement, follow-up report. The template was sent to the responsible staff and a deadline was set. Upon receiving the templates of the action plan, the committee reviewed them and discussed any missing information with the person, committee, or unit responsible for the execution and follow up. After multiple reviews the Improvement Plan was raised to the University Council for approval, before being delivered to the QQA. This is a second version of this improvement plan, since the first version was reviewed by a planned informal visit by QQA. It should be noted that it will continuously be developed and updated based on the progress made while dealing with the IR points and recommendations. 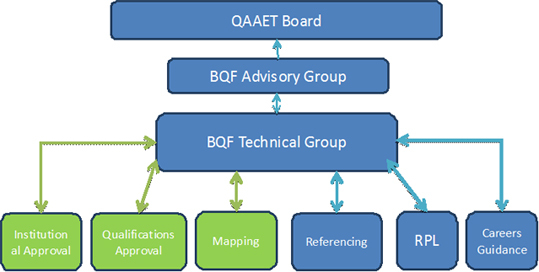 To view the full QQA Institutional Review Report please click here. The University of Bahrain had been part of the following Working Groups at QQA, to develop the education system in the Kingdom of Bahrain.